Thomas of Brotherton, 1st Earl of Norfolk. Thomas of Brotherton, was the fifth son of King Edward I and his first born child by his second wife Margaret of France, the daughter of Philip III of France and Maria of Brabant. He was a younger half-brother of King Edward II (1307-1327), who was the son of the king's first wife Eleanor of Castille. Thomas was born 1 June 1300 at the manor house at Brotherton, in Yorkshire, while his mother was travelling to Cawood, where her confinement was scheduled to take place. Margaret is said to have been staying at Pontefract Castle and was following a hunt when she went into labour. The chronicler William Rishanger records that during the difficult delivery which followed, Queen Margaret prayed to St. Thomas Becket, Archbishop of Canterbury who had been martyred during the reign of Henry II. The new born child was accordingly named after the saint and was baptised the Church of St. Edward the Confessor, at Brotherton. 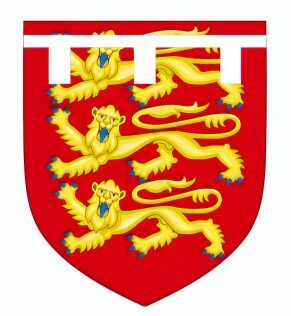 As a younger son of Edward I of England, he was entitled to bear the coat of arms of the Kingdom of England, differenced by a label argent of three points. King Edward I joined the queen and was said to be delighted by his new son, whom he presented with two cradles. A brother Edmund of Woodstock, later created Earl of Kent, was born in the following year. Despite the discrepancy in their ages, the marriage appears to have been a happy one, Edward referred to Margaret as "a pearl of great price". In 1305, Margaret gave birth to a girl, Eleanor, named for Edward's first queen, who died young in 1310. Their mother often accompanied King Edward on his campaigns to Scotland, but took a lively interest in the well being of her children. His father died at Burgh on Sands while leading another expedition into Scotland when Thomas was 7 years old. His mother Margaret never remarried, despite being only 26 when widowed. She is said to have stated, "when Edward died, all men died for me". His half-brother, Edward, succeeded as King of England and Thomas was heir presumptive until the birth of his nephew, the future Edward III, in 1312. The Earldom of Cornwall had been intended for Thomas, but Edward II instead bestowed it upon his favourite, Piers Gaveston, in 1306. When Thomas was 10 years old, Edward assigned to him and his brother Edmund, the estates of Roger Bigod, 5th Earl of Norfolk who had died without heirs in 1306. In 1312, he was created Earl of Norfolk and on 10 February 1316 he received the title Earl Marshal. Thomas was known for his hot and violent temper. He was one of the many victims of the unchecked greed of the king's new favourite, Hugh Despenser the Younger and his father Hugh Despenser the Elder, who stole some of the young earl's lands. (ii) Margaret, Duchess of Norfolk, who married firstly John Segrave, 4th Baron Segrave, and secondly Sir Walter Manny. (iii) Alice of Norfolk, who married Sir Edward de Montagu. After the death of Alice Hales, Thomas married for a second time to Mary de Brewes, widow of Sir Ralph de Cobham, and daughter of Sir Peter de Brewes of Tetbury, Gloucestershire, by whom he had no surviving issue. Thomas allied himself with Edward's Queen, Isabella of France and her lover Roger Mortimer when they invaded England in 1326, and served as one of the judges in the trials against both Despensers. King Edward II was deposed and imprisoned firstly at Kenilworth Catle and later removed to Berkeley Castle in Gloucestershire in January 1327. Thomas de Berkeley and Sir John Maltravers were appointed the ex-king's custodians. In the summer of that year, following a failed attempt to release him, in the interests of the safety of the new regime, it was considered more convenient if he were dead. He was placed in a dungeon, into which was thrown filth and rotting animals, in the hope that he would contract some form of disease and die, thus removing from his captors the responsibility for his murder. Edward, an extremely fit man, continued to doggedly survive this treatment. According to the rather gory traditional belief, Edward was murdered in a bestial manner on the orders of Mortimer and Isabella on around 11th October, 1327. A red hot poker was inserted into his entrails by means of a horn, to leave no outward marks on his body. The people of Berkeley were said to have heard the agonized screams of the dying king outside the castle. The country was then ruled by Isabella and Mortimer in the name of Edward's eldest son, the young king Edward III. When his nephew Edward reached his majority he asserted his authority, and took the government into his own hands. Mortimer was executed while his mother Isabella was shut up at Castle Rising in Norfolk, where she could meddle in affairs of state no more. Thomas became one of his nephew's principal advisors. In the capacity of Lord Marshal that he commanded the right wing of the English army against the Scots at the Battle of Halidon Hill on 19 July 1333. Thomas, Earl of Norfolk died around 20 September 1338, and was buried in the choir of the Abbey of Bury St Edmunds, the chief religious house in medieval East Anglia. 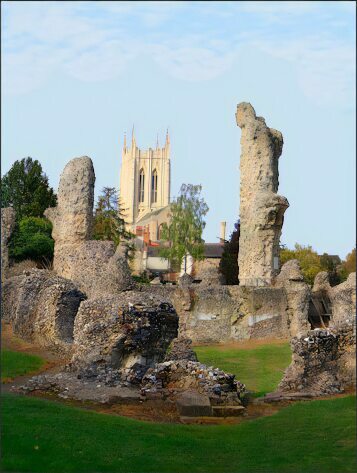 The Abbey had suffered riots and destruction from disaffected townspeople in 1327, and tremendous rebuilding efforts were required, towards which Thomas had contributed. His coat of arms appears on the principal gatehouse, which still stands.